Today I want to talk about a topic in golf that I hear a lot of people talk about, but they often don’t fully understand. That’s shoulder rotation in the golf swing, and there are two questions that I always hear. When should it happen and how does it actually happen? 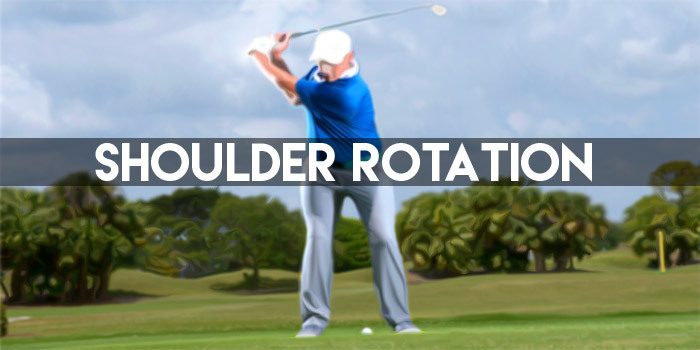 How do we get a massive amount of shoulder rotation that we see the professionals do, so we can deliver the club the way we want to so we can have more power and be more consistent. The first thing you want to know about rotation we’re going to use our 4D motion sensor to help. It’s going to be measuring in three planes of motion so I’ll just talk about what those are. As I get set up, rotation is the first thing we measure and the one we know most about is just if I’m standing straight up and down, there’s rotation. Then, there’s side bend. This is the second measurement and that’s just me bending sideways. That’s another way that our shoulders can move. Then the third measurement is they can bend forward or backwards. So you’ve got rotation, you’ve got side bend, and you’ve got forward or backwards bend. Those are the three ways that you can move your shoulders in a golf swing. So we really want a combination of all of those as we go. But let’s talk about what we see as the two most important to get a massive amount of rotation in our swing. If we were to take our set up using our 4D sensors, we can see I’m going to get pretty close to square at the start. You might not be 100 percent square, but one thing that we see from really good players is they get a lot of turn early in their swing. By the time that club gets to about parallel with the ground we already see them getting 30 to 40 degrees of rotation. Whereas the average player, I see sometimes 10 degrees or 20 degrees or very little rotation where they’re just mainly moving their arms to start the club away. So what happens then is you’re going to start trying to get your rotation. Everybody says they want to have rotation, but they often try to get it late in their back swing and that throws off some other angles as you’re trying to go through the ball. It also throws off your pressure. It really becomes tough to generate power and still hit the ball solidly. So what we’d like to see is a good amount of rotation early off the ball. Now, there’s one little caveat that goes with this as we’re trying to get 30 to 40 degrees of rotation by the time the club gets to this point. One thing that we need to know is how we generate that much rotation. If I was to stand right where I’m at and I started to bend sideways and I’m increasing my side bend as much as I can almost to an uncomfortable level. You’re going to see that rotation number really spike up because the way that we judge rotation again is it’s a combination of two metrics. If you do just one of them. You’re not going to get a lot of rotation. So if I see somebody that takes a set up and they stand up and they’re not keeping their side bend, their rotation number is going to be down. They’re going to have less rotation. The other way is if they go ahead and just side bend, their rotation number is gonna be down. So you’re looking to see if you can keep your rotation number going up by combining side bend and rotation on the way back. And our goal is by about this point we want to have about 30 to 40 degrees of rotation. So to get that we need approximately 10 to 20 degrees of side bend at this point in our swing to be able to add them up and get to that rotation number we’re looking for. Everybody always is looking for a rotation, so they want to turn more on their back swing. One thing is you want to turn early in your back swing. You want to start the swing off by getting a lot of turn. And how do we do that? Well, we have our turn, but we have to combine it with some side bend and that’s what’s going to get us to those numbers that we see Tour players get to. That helps them hit it farther and be more consistent and hit the ball on the lines they want to, which is what we should all be want to in our games. So go ahead give that a shot. You can start practicing it at home or you can practice on the range, while getting used to how your body moves in a three dimensional world. It’s going to help your game and is going help you get more power.